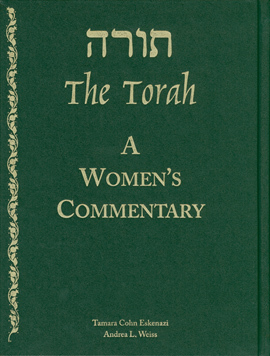 Below are personal essays from three of the women who contributed to The Torah: A Women’s Commentary. Each author was asked to describe “either an inspiring or a frustrating moment that shaped you spiritually as a girl/woman.” As you will see, all three essays help us even better understand why it is essential for women to keep “telling their stories” and continually adding to the research. How a piece of art challenged one woman to bring new voices together to discuss the Torah. It was the summer of 1976. I had just graduated from college and was about a year into a renewed and intensified journey of Jewish involvement, study, and practice. I was strolling through the Jewish Museum in New York with a friend when I found myself standing in front of a large painting of four young yeshivah bokhers (students) sitting around an open Talmud, studying. Two of the young men were locked in intense debate, leaning towards each other, hunched over the text as they argued, their faces animated. One was adding emphasis to his words with hand gestures while the other seemed to have the same intent as he pointed to some words on the page. The third student sat with his face close to the page, frowning in concentration as if struggling to understand the words he was reading, while the fourth sat pensively stroking the beginnings of a beard and gazing off into the distance. I was immediately drawn in. The first two students’ intense engagement with the text and with each other caught my breath, but each of the four personalities touched me. This was it! This was what I wanted. My re-entry into Jewish life had started with a Torah discussion following Friday night services 10 months before, and had led me to discover a passionate love of text study that included Torah, midrash, and Talmud. I was hungry for more. In that moment I felt like I was looking at my heart’s desire—to immerse myself in traditional Jewish learning of texts with other people. The identification was complete. But in the next moment, I realized with a jolt—“Wait—they would never have me at the table!” With the same intensity that I had felt myself drawn in, I now felt shut out, pushed way. It was a painful moment. I have thought about that experience—invited in and shut out by the scene of traditional study—many times since that day in June. Even then, I knew I could find places to study, teachers from whom to learn, and other Jews on a similar search. But I also knew there were realms in which, as a woman, I would not be welcome. I went on to find many tables and to create my own, traditional and creative, inter-denominational and post-denominational, at which to study and teach. I love Jewish text study of all kinds—Torah, Talmud, commentary, and midrash—and I love teaching. I became a rabbi in order to bring other people, especially women and others who have felt shut out by the tradition, to the table and to the “Big Conversation” we have as Jews, centered around our sacred texts. I strive to enable others to discover how Torah can challenge them to live more deeply and bring holiness into their lives and the world. It has also been important to me that we bring women’s voices into our evolving textual tradition. Over the last several decades, bookshelves have been filled with Jewish women’s scholarship and creative midrash, biblical commentary and exegesis, legal analysis and artistic expression of all kinds. I have enjoyed participating in this process and benefiting from the work of so many others. There is room for everyone. Everyone’s questions and insights, everyone’s struggles and concerns, everyone’s fears and dreams. Listening to each others’ voices as we try to hear and understand the voices from our past, we discover who we are as human beings and as Jews, trying to make meaning of our lives. This beit midrash, this House of Study, is, indeed, a taste of the World to Come. Rabbi Ruth H. Sohn teaches Jewish studies (or Bible, commentary and rabbinics) at the Milken Community High School of Stephen S. Wise Temple, and also teaches adults in various settings in Los Angeles. Her articles, biblical commentary, midrash, and poetry have appeared in various periodicals, prayer books, and books including Reading Ruth (Ballantine), edited by Judith A. Kates and Gail Twersky Reimer, and Kol Haneshama, the Reconstructionist Prayerbook. Ruth was ordained at Hebrew Union College–Jewish Institute of Religion in 1982. She worked as a Hillel rabbi at Columbia and Boston universities for 10 years before moving to L.A., where she lives with her husband and three children. How a bit of competition led to a lifelong challenge of bringing women into the Jewish fold. When graduating from Hebrew high school at Congregation Shaarey Zedek, each senior was responsible for writing and presenting a speech on a Jewish topic of his/her choice. What remained unknown was who would receive the engraved Kiddush cup in honor of being the best student in the after-school program. During our senior year, the class met Monday evenings at the synagogue, ate pizza and mildly tortured the man with a PhD in philosophy who exposed us to the grappling of Jewish philosophers with the idea of God. Although a number of students were consistently loud and rude, persuaded to graduate Hebrew school by the promise of a new car, there was some stiff competition from the quiet, studious bunch who absorbed the material without saying much. Other Kiddush cups were dispersed during the graduation ceremony, but everyone recognized the presentation of the cup as the ritual climax. Although not egalitarian, the ceremony was tradition. My heart was set on that cup. On our bookcase stood my mother’s Kiddush cup from 1953. As she often told me by way of a life lesson, hers was not the cup for the best student—this had gone to Toby Greenberg—but only the cup for the second best student at Shaarey Zedek. If I were as outgoing and involved as she was while doubling or even tripling her diligence, she explained, then the title would be mine. Amidst my longing for the cup, I had to admit certain impediments. I had only joined the Hebrew school in the eighth grade after transferring from Jewish day school to prep school. A few years later, when my father remarried and stopped paying for prep school, I had dropped the tenth grade of Hebrew school in order to spare my mother the cost of an Israel trip on top of school tuition and the new car necessary at sixteen for young Detroiters. “Havrelock? What kind of name is that? Are you a member?” the sisterhood president asked out loud. Such was suburban Detroit and such were the identity markers I carried. Still, my passion for Jewish texts surpassed that of both the rude and the studious in my class. My heart soared and sank with the musings of Jewish thinkers and I, too, wondered how to fashion a conception of the Jewish God. Wanting the cup while aware of my inherent disadvantages, I searched for an appropriate speech topic. I considered a theological speech, but knew the congregation to be built on the pillars of the Holocaust, Israel, and the labyrinthine interconnections of the Detroit Jewish community and that, therefore, I would quickly lose my audience with philosophic approximations of the nature of the Divine. Then, it occurred to me: not one woman was counted among the Jewish philosophers we had studied and this thought led to the realization that when we studied Bible, we studied men. When we studied Israel, we studied men (with the exceptions of Hannah Senesh and Golda). And when we studied ethics, we learned how Jewish men thought we should behave. I decided to give a talk about a woman. I began to search the topic of Jewish women in my regular school library and there I first read the story of Lilith. Lilith was the first woman, created as Adam’s equal. She was the “female” forged in the image of God in Genesis 1:27, which reads, “In the image of God, God created the human, male and female God created them.” Lilith lived as an equal in the garden until she refused to submit to Adam, uttered the ineffable name of God, sprouted wings and departed the Garden for marginal social status and immortality. To me, Lilith was an epiphany. A woman created as an equal with a penchant for resistance surely provided women with another sort of myth to live by. I would bring Lilith to the bimah of Shaarey Zedek, which, as I now realized, had yet to host a woman rabbi, cantor, or scholar. Along with recounting her story in animated detail, my speech challenged the audience to re-imagine the conclusion of Lilith’s tale. What if, rather than relegating Lilith to ignominy and child killing as had centuries of rabbinic commentators, we made a place for Lilith in our concept of creation? What if we embraced the marginal, the rebellious, and the resistant figures of the Jewish tradition rather than stigmatizing and excluding them? What if we made an equal place for women in our Jewish utopias as well as in our organizations? As I was facing out, reveling in the discovery of my vocation as Jewish feminist scholar, my mother watched the stunned faces of the rabbi and cantor and the proud grin of my Jewish philosophy teacher. As my mother saw it, my speech made it even harder for him when the rabbi presented the Kiddush cup for most outstanding student to Rachel HAVRELOCK. Not only was I a student with an incongruous last name and not really a member of the congregation, but I had also dared to bring Lilith to the bimah. All the same, I was the recipient of the Kiddush cup of 1990. That day, I made a place for Lilith as well as for myself in the spaces and canons of Jewish life. Since I gave that first Jewish feminist speech, I have been devoted to the projects of Jewish study and envisioning a Judaism with equal representation of women. As the profound shifts in the Jewish tradition have often begun with new commentaries on the Torah, I believe that the Women’s Commentary on the Torah marks the great revolution of twenty-first century Judaism—the inclusion of women in every sphere of Jewish leadership and life. Rachel Havrelock is a professor of Jewish studies at the University of Illinois at Chicago where she teaches courses on Bible, gender in Judaism, and the intertwined histories of Judaism and Islam. She is the coauthor of Women on the Biblical Road: Ruth, Naomi and the Female Journey (University Press of America, 1996) and is currently finishing a book about the history of the Jordan River as a border, River Jordan: The Mythic History of a Dividing Line. While working toward her PhD at the University of California at Berkeley, Rachel studied at Tel Aviv and Bir Zeit Universities. The play that she wrote and directed, From Tel Aviv to Ramallah, reflects her experiences in the two cities. Biblical scholarship doesn’t give this woman answers; it helps her articulate questions. I can recall the moment when I first felt God. Despite a childhood spent attending religious school and going to synagogue, this moment came when I was 12, sitting on a bench in an outdoor chapel at Jewish summer camp. The chapel was on the top of a hill and it overlooked the Pacific Ocean. As the sun set over the water and clouds slowly rolled in, I closed my eyes and prayed. As I shut out the world, I sensed a shallow-deep, warm-cold, understood-confused, safe-scary feeling inside. The words of the page and the words of my soul mingled together and for that instant, I felt connected to the soul of the universe. The sensation of that encounter took deep root within my adolescent self and seeded within me a desire to seek and learn. Who was this God I thought I had felt? What were those words I prayed that seemed to call that God to me? How could I recreate that moment? A few years after that chance encounter, my family and I moved from Huntington Beach, California, to Nixa, Missouri. Nixa High School, one might not be surprised to learn, provided me with a host of new contexts for thinking about God and prayer. My classmates, who were primarily Southern Baptists and Evangelical Christians, looked at the world through different eyes, and had questions for me. They wanted to know about my “Jewish faith,” and the “Jewish Bible,” and the “Jewish laws.” And, faced with their rock-solid beliefs and gentle souls, I found I had pitifully few answers. During high school, I was faced again and again with my own inability to articulate the complexities and nuances of my tradition. It wasn’t until I spent a quarter of my senior year studying in Israel that I began to articulate what I knew I needed to know. I needed to understand my history. I needed to understand Hebrew. I needed to understand other Jews and their practices. I felt that I couldn’t authentically face the world or myself without knowing answers to my pressing questions. As a student at Brandeis University, I took Jewish studies courses and studied Hebrew. I was active in the Reform Minyan and taught religious school. I studied abroad in Israel. I wound my way through a degree in sociocultural anthropology and studied the Jewish identity of university students. I studied Jewish mysticism and liturgy and history. But still I felt incomplete. I applied to rabbinical school during my senior year. When the acceptance letter from the Hebrew Union College–Jewish Institute of Religion (HUC) came, I shouted and celebrated and cried alone in my car outside of the campus mailroom. Looking back on my life, I find it surprising that the first time I studied the Hebrew Bible with any seriousness was during my second year at HUC in Los Angeles. It was in these classes that I finally began to deconstruct my belief system and to reconstruct it anew. When I study Tanakh, something in me settles. As I read and wrestle, I feel the presence of God and the presence of generations of the Jewish people. I encounter myself in the poetry and in the prose. It’s not that biblical scholarship gives me answers, it’s that it helps me determine the questions. When I teach Torah, I can’t help but bounce up and down. The movement is reflexive. When I write about Torah, my knee bounces uncontrollably, I hammer the table, and I smile. I think back to my early years of searching and I realize that the search has, for the time being, led to this point. Today, the way that I encounter God is no longer on a hillside, but in the pages of my now well-marked and well-used Tanakh. I no longer feel inadequate when faced with questions whose answers elude me, but am energized by the catalyst to explore more. I feel blessed that my life is defined by learning and teaching. For me, the opportunity to work on A Women’s Commentary has been a profound gift, one that has opened up even more doors to even more wrestling. Rabbi Jocee Hudson currently serves as director of religious education at Temple Beth Sholom of Orange County in Santa Ana, California. She holds Master of Arts degrees in Jewish education and Hebrew letters and was ordained as a rabbi in May 2007 from the Hebrew Union College–Jewish Institute of Religion in Los Angeles. During her course of studies at HUC–JIR, Jocee received awards in Bible, liturgy, and Jewish education. Jocee graduated with high honors from Brandeis University, receiving a Bachelor of Arts degree in sociocultural anthropology and a minor in Near Eastern and Judaic studies.